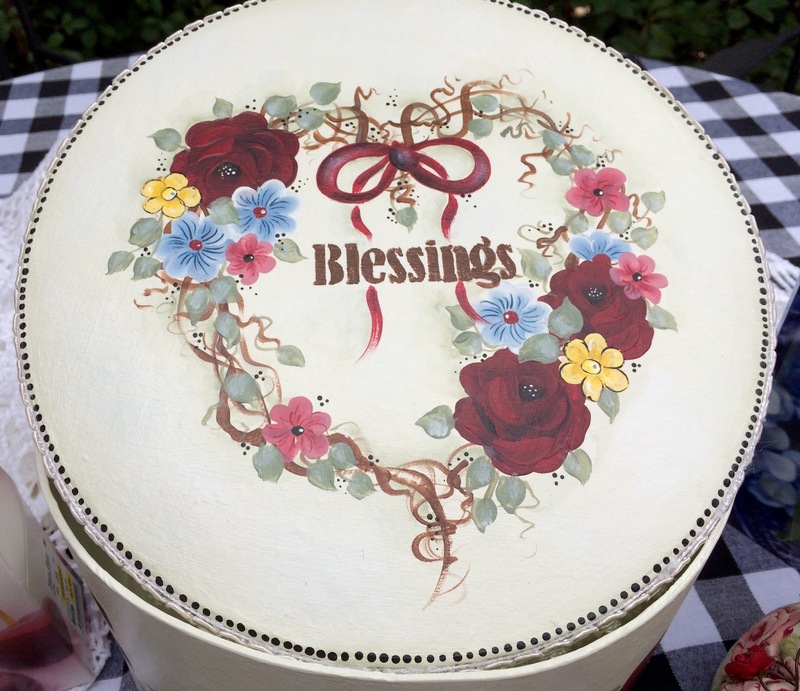 Look at this gorgeous hand painted hat box that Celeste painted especially for me! I am truly honored. Look at all the pretty detail . The trim around the lid is just exquisite! Look at the beautiful rose, the checkerboard, and the darling dots. This rose is inside the hat box, at the bottom. I was overwhelmed by all the beauty, time, and talent that went into this work of art. And then...this teacup that matches the design on the hatbox!! Can you believe it??!! Celeste even sent a pretty spoon for my tea. How did she know that I have been wanting a teacup with some black in it? It's so elegant and all my favorite colors, too! Celeste also made this darling pumpkin. Isn't it the sweetest with the lace, roses, and cute tendrils and top? The pumpkin is going in my bedroom, as it fits right in. 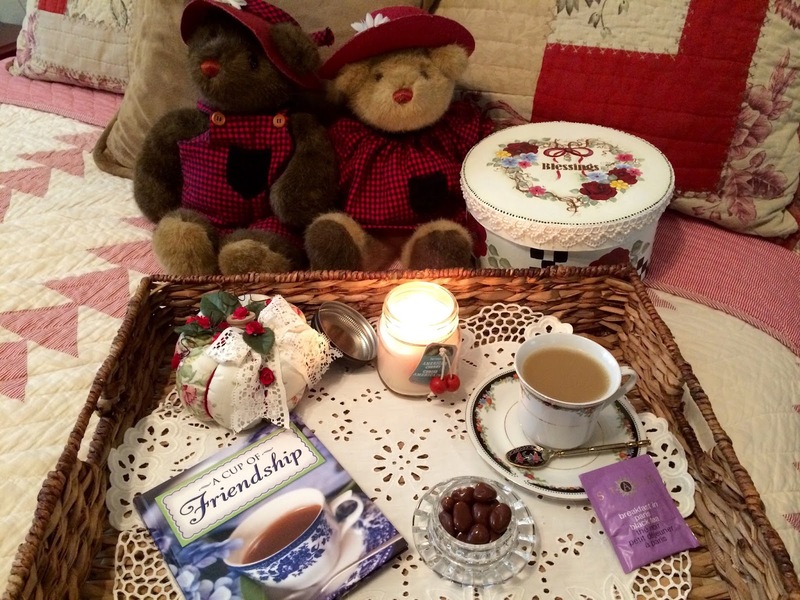 If you'll please excuse me, I'm going to enjoy a cup of Breakfast in Paris tea in bed, some chocolate covered cherries, and read my Cup of Friendship book, all while enjoying my cherry scented candle. Thank you Celeste from the bottom of my heart! Celeste is a fellow Texan and we hope to be able to meet one day. Thank you, also, to Stephanie, who organizes this lovely teacup exchange. Without her, none of these friendships would happen. Linda was my recipient for the gift exchange, and in my excitement to mail my gifts to Linda, I had forgotten to take a picture. I copied a picture that Linda put on her My Sew What Blog. The thrill of giving gifts to your recipient is such a joy and I thank Stephanie for providing that for us. 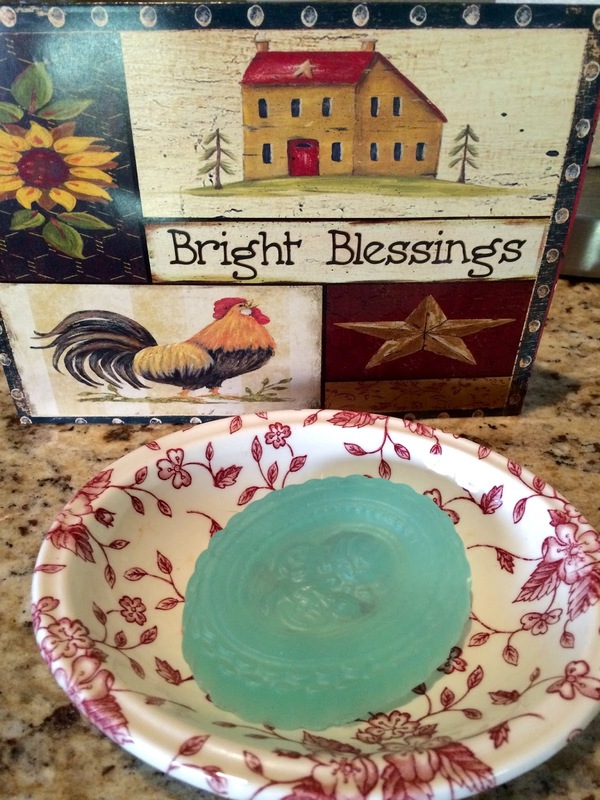 As an expression of her gratitude, Linda sent the sweetest note and some homemade soap. The soap is such a pretty color and it makes my skin feel so great. Thank you, Linda! What a beautiful box and I love the tea cup! You truly did receive blessings! Oh Kitty! What a delight Stephanie's tea cup exchange is...I am so looking forward to receiving mine! Celestina is dear and sent you the loveliest goodies...and your tea cup is simply gorgeous! Do enjoy your wonderful new tea...and oh! 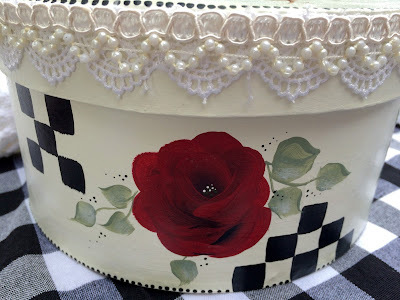 I must say how much I adore the sweet hand painted hat box! Beautiful! Have a blessed week, dearest Kitty! Hugs to you! Hi Kitty, It was such a pleasure and joy to exchange with you in Dear Stephanie's teacup exchange. Meeting you and knowing we will actually meet up in person is something to look forward to for me and I know it will be a blessing. 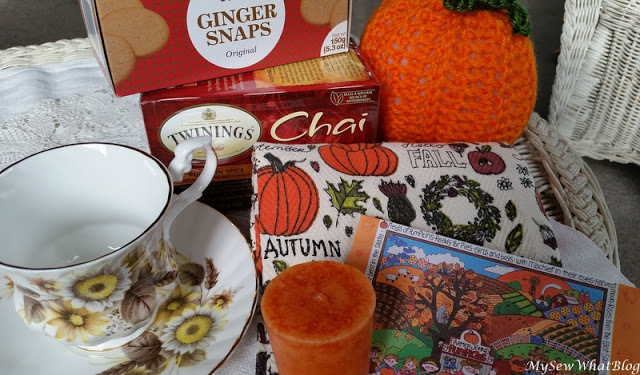 Thank you for the mention here in your reveal post and so glad you are enjoying your new cup and goodies. Thank you also for the sweet thank you gift from you that I will also reveal in my post on Wednesday. Yes, thanks to Stephanie for bringing new friendships together. That's a big part of the gift!! Wishing you a wonderful new week with many blessings. p.s. as usually I forgot to take a pic of the things I sent you. May I have permission to copy one of your pics from this post for my own record?? That box is perfect for the teacup! How talented! And what a wonderful array of goodies! Thanks so much for linking to Tuesday Cuppa Tea! This is such a great idea! How fun! Kitty, the black check tablecloth is perfect with your new cup. Perfect! What an amazing package, Kitty! The handpainted box is beautiful, as are the matching teacup and teaspoon. The pretty floral design of your new teacup is reminiscent of Mary Engelbreit. Hope that you and Celestina Marie will get an opportunity to meet in person soon! Oh my...what a beautiful package!!! I love the teacup and spoon!!! 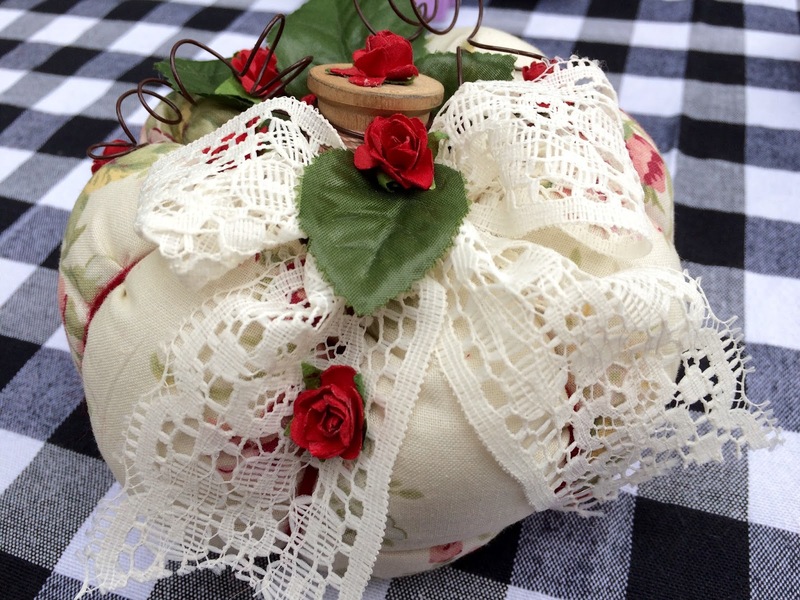 The hatbox is gorgeous and handmade pumpkin is too sweet!!! Celestina Marie is one talented Lady!!! That is a beautiful package ! How pretty everything is! That is one generous package and the tea cup is lovely! Kitty, your hatbox is simply splendid and how perfectly it matches the teacup and the sweet spoon. They really do suit you. Celeste does such amazing work and she gifted you very well. The little pumpkin is adorable too and the soap from Linda is a gorgeous colour. Your package certainly is blessing. Thank you for sharing with us. I see - it actually matches the cup and saucer. Now that's amazing. I sure can't do that! How wonderful to receive these items! I am so glad you shared them at "Friends Sharing Tea"! Why what a talented person Celeste is with all these lovely gifts she created. Your cup and saucer which matches the box is truly a treasure. The tea time tray has so many amazing luxuries and is a grand way to enjoy tea at leisure. Please, pop over and view my post this week! I am so glad your gift package was also enjoyed! You are a sweet person and hope we will have cooler Texas weather soon! Beautiful gift exchange! Enjoy it all, Kitty. Kitty~ Celestina has certainly graced you with a treasure box of goodies, all so beautiful. That tea cup is absolutely gorgeous, and the son is beautiful with our. Celestina is such a dear dear lady! How wonderful should the two of you meet some day. And Linda is a dear as well. You have made some wonderful new friends in deed. I ment to say~ That spoon is beautiful with it. How wonderful to have a hand painted box by Celestina arrive with your matching teacup and other treasures in it. I loved participating in this exchange and found our hostess Stephanie to be the sweetest woman. Hi Kitty, What a sweet parcel to receive in the mail. The tea cup and all the extras are so pretty and suit you to a "tea." I participated for the first time and found it lots of fun. 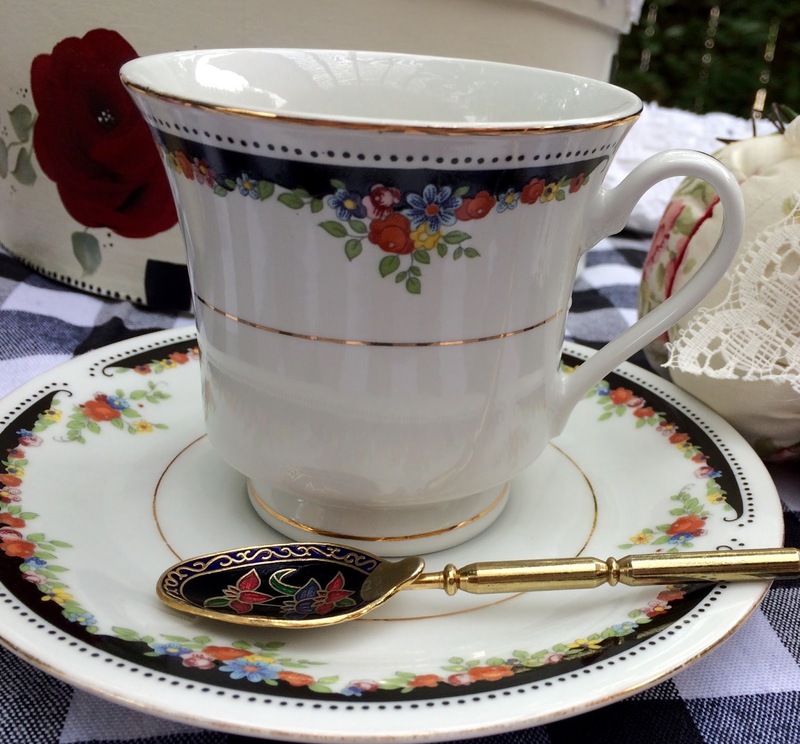 What a fabulous gift you received in the teacup exchange. I especially love the hand painted box to coordinate with the teacup. How creative! You're a very deserving recipient! Celestina is amazingly talented as well as being such a sweetheart! Your gift is beautiful and so fitting for you. I adore the tea cup, saucer and spoon! To duplicate that pattern on the hat box is really special. This was my first time to join in and it's so fun! What a wonderful package to unpack, you certainly were blessed. Oh Kitty, what a stunning package from Celeste! She is such a lovely lady and she pours her heart into others....just like you, my friend. 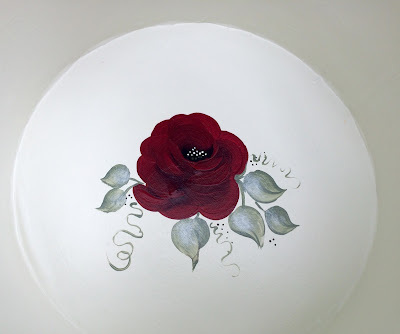 The handpainted box is stunning and matches the beautiful tea cup perfectly. And the pumpkin....darling! You, my dear, are so special to me and your encouragement and support during these exchanges means the world to me. Thank you from the bottom of my heart for being a faithful participant. I love you, sweet friend! Such a beautiful gift from Celestina. Her painting skills were at work and it shows beautifully. I know you are really enjoying this treasure. 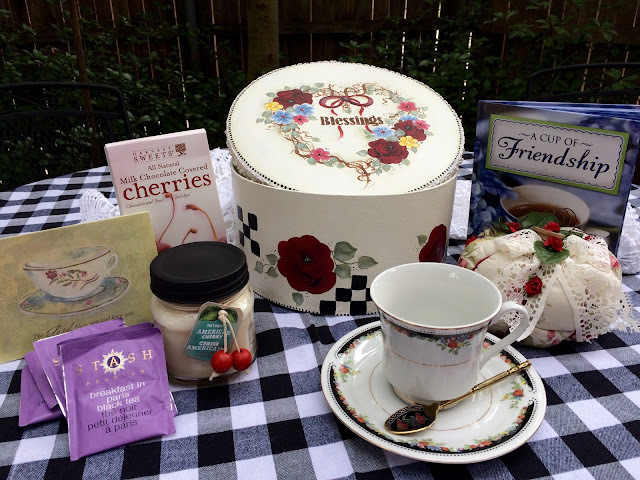 Wow what lovely gifts you received from the teacup exchange from Celestina. I do love these exchanges and so nice to form new friendships. Enjoy everything! We love having you and have a wonderful week. Kitty, how delightful! The colors on your teacup, saucer, and spoon remind me of Mary Englebreit. What a gorgeous hat box too! What a beautiful pckage you received from Celestina! The painted box is just beautiful! I love the painting that she does! So, so talented! I love the teacup with a touch of black. It has a very classy look to it. The spoon is so cute!I have tried the tea that Celestina sent too, it is delicious! Enjoy! I'd like to thank you Kitty, once again for my beautiful teacup. I love it and I have used it every day since I received it. I love that I have met so many wonderful friends through Stephanie's swap and I am happy that I've had the opportunity to become friends with you too! The hand painted box is simply beautiful! Celeste is certainly quite the artist. What a beautiful keepsake and memory of this exchange. I do hope the two of you will meet some day. (I think the spoon and cherry candle are so cute.) It's been fun reading about all of the happiness this exchange has brought to so many. Thanks for sharing! Hi Kitty, That teacup is absolutely GORGEOUS!! A touch of black adds some elegance to every room. The spoon is also a beauty, but that hand-painted box is a true treasure! Wow! I hope you and Celeste do indeed get to meet in person someday. I also love the pretty fabric pumpkin she made and the book -- what a wonderful gift package you received!! I also love the pretty soap that Linda sent you; all these things make such nice little touches around your home. :) I hope you're having a great month so far and are enjoying nice weather in Texas. Blessings to you, my friend! Oh my goodness...what a gorgeous package of goodies! Celestina is ONE talented lady to have painted these lovely designs...everything is so well coordinated and she most definitely knows your colors, I regret not taking photos of the package I sent out. This was my first exchange and I just wasn't quite sure...next time I will know to do this! Have a wonderful evening, Kitty! Oh my...such a plethora of gorgeous pretties! The hand painted box is exquisite and then to open the lid and see that gorgeous tea cup and that darling spoon.....so, so pretty. I can see you in my mind's eye sitting there in your boudoir sipping your Breakfast in Paris tea in that pretty tea cup. Oh, you hit the jackpot with Celeste! She is so talented, and generous, too! That box is simply stunning. It's humbling to think of the amount of creativity and work that goes into these gifts. I see you made another sweet pumpkin. So kind of you! The cup and spoon are gorgeous together, too. And her pumpkins are adorable. What a fun exchange! Wow! Such beautiful pieces...everything is lovely! Hi Kitty, oh such a lovely gift from Celeste. She is a very talented lady. I love how everything matched. You deserve such a wonderful gift. What a wonderful and special gift you got dear Kitty, from lovely and talented Celestina! Love the hat box she decorated herself to match the gorgeous teacup with a little black you wanted... and the cutest tea spoon to go along, wow, what a great teacup exchange. Your gift was gorgeous too.